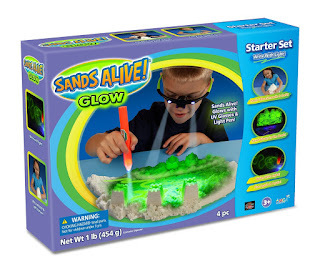 Living a Fit and Full Life: Keep Kids Entertained with Sands Alive Glow! Sands Alive Glow is incredibly fun! I absolutely love how little mess there is to clean up considering it's sand I thought it would be everywhere. I also have to admit that I love the way the sand feels. My girls and I have been playing with Sands Alive Glow everyday and it's such a relaxing yet entertaining way to spend time together. Sands Alive Glow comes with a UV pen light and UV LED glasses so kids can turn down the lights for even more fun. It still glows with the lights on but it's incredibly fun to play with it when the lights are dimmed. I also have to add that I really like that Sands Alive Glow is 100% Non-Toxic and Anti-Bacterial. My girls love that Sands Alive Glow is soft and moldable and because it's moldable it stays together making cleanup a breeze. 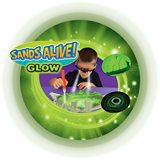 If you're looking for a fun way to keep kids entertained, Sands Alive Glow is it! It's an absolute blast! Click HERE to learn more about Sands Alive! Follow Sands Alive on social media!